Image: Roy Rochlin/Getty Images Entertainment. Design: Allison Kahler/Stylecaster. 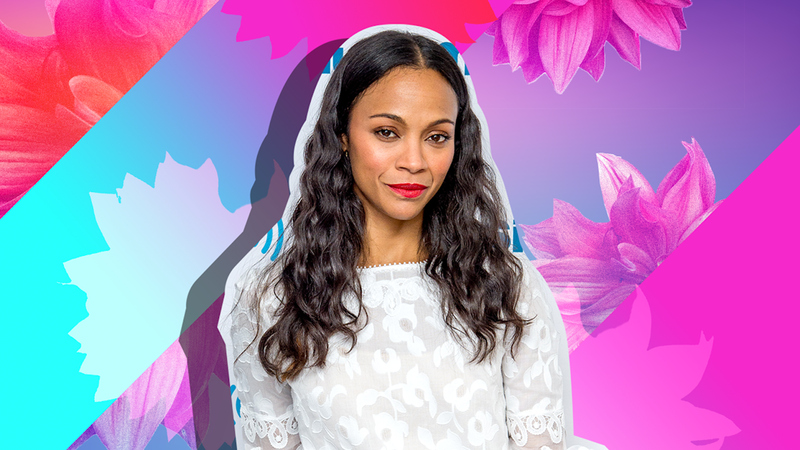 You might know Zoe Saldana as a green, extremely strong extraterrestrial or a large-and-in-charge blue royal Na'vi. Although she doesn’t actually look like the characters she plays in Guardians of the Galaxy and Avatar respectively, their fierce and playful personalities match hers perfectly. It makes sense that the actor blends power and play in her everyday life because she has a ton on her plate: work, activism and three baby boys — twins who are 3 and a 1-1/2-year-old. Amid her busy schedule, we had the pleasure of catching up with Saldana as she enjoyed an Italian getaway with her family. Among talking in Italian to her children, telling us she wishes she could send us photos of them dressed as jaguars and tigers, and eventually sending them outside to play, we found out quite a bit about Saldana. Ahead, in her own words, she tells us how she treats herself, how she and husband Marco Perego find time together and most important, her comfort food. "I think it’s a mixture of definitely having good hygiene while trying to work with your body’s natural scents. Like, whatever your body’s natural essence or scent or smell it is that you have, match it with the products that you use. I think there are so many products that we like to use for ourselves that don’t necessarily match our chemistry, like our physical chemistry. That means taking the time to go and invest in good brands, finding them and going through different products and testing how everything is on your body — how it smells in the morning, and the afternoon and then in the evening. I think it’s the best thing you can do for yourself because self-care is always being super-clean and taking a bath, washing your face and flossing right before you go to bed no matter how late you get home, but also trying to match your body’s natural temperature." "I think it’s a combination of both [learning self-care from a young age and having it change as I grow older]. I was always taught to take pride in the way that I clean and maintain myself. I think using a lot of home remedies and natural products like olive oil and things that are super-pure, like shea butter, are things I learned growing up as a New Yorker. But I’ve also learned as I grow older to invest in brands, not necessarily expensive or inexpensive brands, but to look into how these brands are put together, the pride that the company takes into making their products for their consumers. It’s important to know what you’re putting on your body or skin, the specific ingredients. I like nurturing myself by paying close attention to what I’m doing with my body." "I really like Davines. It’s an Italian brand, and I like them because they use a lot of organic ingredients for their line. And for face, I’m a huge fan lately of Dr. Hauschka, but I also like to wash my face with regular Cetaphil from the pharmacy. I love it." "It has to do with the fact that our children are still so very young. We have a set of twins [3 years old] and a 1-1/2-year-old. So their demand for their mommy is exceptionally high right now. They’re so vulnerable and so codependent, and I know as they get older it’ll get easier. I’ll be able to go back to my earlier routines and things that I used to do when I had a lot more time to dedicate to myself. But right now, my husband and I, we do what we can, and we’re grateful — even if it means staying up later so we can spend time together and have conversations. Right now, the best thing that we do when we have those 30 minutes off is that we reminisce on how fun it was when it was just us! [Laughs]"
"Oh, my gosh, there’s too many, just too many. But so many of them have rice in it. I love rice. I grew up with rice. It’s a part of my heritage. I also married into a culture where rice and pasta are comfort food. Anything with rice I completely live for!" In our series “Operation Recharge,” we task celebrities and influencers with sharing what self-care means to them as well as the activities, products and treatments they indulge in for downtime done right.